(A PDF of the Registration Form and the Courses are listed below. The South-Western City School District Community Education Program offers courses in computers/business, construction, horticulture, industrial, medical, welding, and adult basic education. Visit the sub-pages above to find out more! 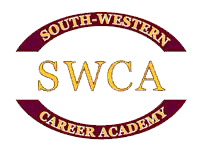 Note: All Community Education classes take place at the South-Western Career Academy. Any questions regarding registration or additional information call 614.801.3477.
satisfactorily meets the specified course requirements. • Enrollment is open to any adult, 18 years of age and older. recommended for all medical courses. ​ in, or be otherwise subjected to discrimination. • Non-residents will be admitted on a space-available basis. registration form and are due on or before the postmark date. to the first 25 paid registrants. • Textbooks, supplies, materials, and lab kits are not refundable. Western City School District Treasurer’s Office. To open and print the registration form, click on the "pop-out" icon in the upper right hand corner to open in a new tab to print. Are you a member of the SWCSD Top 55 Club? Are you 55 years or older? Do you live in the South-Western City School District? If so, you are eligible for the Top 55 Club Card! • Take 10% off of tuition on SWCSD Adult Community Education Classes. The Top 55 card is not valid during tournaments or athletic events sponsored by other groups or organizations. To become a member, simply call the South-Western City School District Communication Services Office at (614) 801-3027, or click the button below to access the form to fill out online. DON’T MISS OUT - ENROLL TODAY!